I know the combinations in this recipe are unimaginable and trust me the taste is equally unimaginable. When I first took a sip I was stunned and amazed at its deliciousness. To confirm my assessment I made my husband drink it without telling him the ingredients and he gulped down the whole glass and asked for another one 🙂 He thoroughly enjoyed it and kept asking me the details and I couldn’t stop smiling to myself. This Watermelon Cilantro Drink is not only healthy but mind blowing as well. And the best possible way to explain the unique flavors in it, would be to simply blend the ingredients in a blender in your home and serve to your loved ones and to your guests. You will be appreciated for this drink forever and innumerable times. With only 6 ingredients, this Watermelon Cilantro Drink is a thirst quencher and super prefect for summer BBQ parties and get-together. Ready in about 5 minutes this beverage is kid friendly as well. In a blender combine all the ingredients (except mint leaves) and blend smooth. Now in the fancy glasses put some mint leaves, some fresh cilantro leaves and crushed ice. Pour the drink from the pitcher slowly and garnish with a lime wedge. Feel free to add more ginger powder if you like your drinks to be stronger. Feel free to slightly increase the measurement of cilantro if you like its strong aroma and flavor. I would have never thought about this, it sounds like an amazing recipe to try, i love trying new smoothies and freshly blended drinks. Such an interesting combo! I’m not a cilantro fan, but for someone who is, I bet this is a great combo. What a great drink! I happen to have all the ingredients on hand — I need to try this! Nice! I’ve never seen a drink recipe like this but I am loving it! Watermelon and cilantro are both SO refreshing! Wow this looks amazing!! 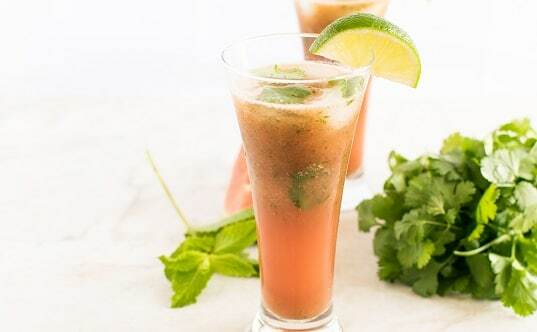 There’s nothing more refreshing than watermelon on a hot day, and I can only imagine how nice it would be mixed in a drink with cilantro and mint!! Eeek, this sounds amazing!! I am so making this. It’s all my favorite flavors in one drink. Yay!! Absolutely dee-lish. Enjoying this drink as I write.